One of the most embarrassing moments that we go through as a consumer is having a declined credit card at the register. And it only makes matters worse when there is a long line of other customers waiting patiently to check out once we’re through. It’s not uncommon in such a scenario for customers to freak out, but a scene is certainly the last thing you want to see happening at your place of business. For us, as merchants, we know it’s not a big deal when this happens and that there are a myriad of non-finance related reasons why a card can be flagged. 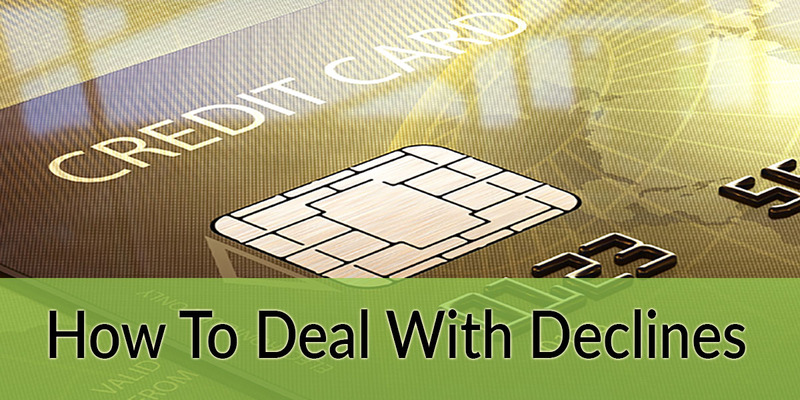 But for a customer, having a card denied is a very stressful and embarrassing situation. It is quite often that a declined credit card will be approved if you just go ahead and run it through a second time. It’s worth 20 seconds of your time to re-process before breaking the news to a customer that their card was declined. For one thing, many POS devices require keying in numbers, so you may have entered a wrong digit or two. Plus, sometimes there are just glitches in the system or the card reader may have misread the magnetic strip. Still not going through? Check the expiration date. It may have passed. This common issue happens to plenty of people, and the customer will be less apt to feel embarrassed if they know up front that the only reason their card was declined was the expiration date. When the situation arises that you do need to tell a card holder that their card has been declined, try to talk to the customer one-on-one to make your conversation more private. Be sure to speak directly and clearly and not in a loud voice that could be heard by other customers. If possible, ask a co-worker to ring up any other customers that are waiting in line. Remember, it’s not just that you are protecting the feelings of the customer who has had their card turned down. Other customers will also take notice of how you handle the situation, which bodes well for your business. When you tell the customer about the decline, do it kindly and professionally. This may seem like a no-brainer, but think about it, whether they get angry, upset, or just plain embarrassed, most likely the customer is going to have an adverse reaction upon receiving this bad news. A little understanding of the pickle that they’re in will go a long way to easing their emotions. Above all, avoid losing your patience. The moment you lose your cool, you’ve just given them the green light to lose theirs. Calmly remind them that there’s really nothing you can do about the decline and that all reasons and solutions can only be given by their credit card provider. When a customer asks you what could possibly be wrong, point out that there are a lot of reasons why cards are declined that have nothing to do with the account balance. Again, this is what customers are generally most embarrassed about, so go ahead and say this nice and loud. It will put the customer at ease to have those standing by hear that there is some other anomaly unrelated to a funds shortage that is behind the decline. According to Melody Warnick, writing for creditcards.com, these are the most common triggers that could cause a card to be declined: making a small transaction followed by a much larger one, shopping in a state other than the one you reside in, or making many purchases in the same day. Let the customer know that one of the downsides to having more advanced security is that sometimes red flags are raised simply because you’ve made a type of purchase you don’t commonly make. When a customer is in this situation all they want is one thing: to pay for the goods and get out of the store as quickly as possible. The best way to help your customer to get through the doors and into the parking lot is to provide alternative payment solutions. Remember, your customer will be flustered, so it is possible that it will totally slip their mind that they can just use a different payment method and be on their merry way. If the total is small, suggest that they simply pay in cash. Do you take checks? If yes, perhaps you want to offer up this alternative. And hey, it’s 2014, surely they’ve got another card in their wallet that you can give a whirl. Perhaps a visit to the ATM would do the trick? All in all, it’s going to be up to you how the client deals with a credit card decline. Your actions can easily make or break the scenario and either have a customer spreading a great story about how you dealt with a difficult and potentially embarrassing situation, or how you completely massacred it.